The Moms were eating lunch while the kids—claiming they were full—exited to play tag. The subject discussed was by no means gloriously thrilling. Spinach. We were talking about spinach. I asked if she had a dehydrator; no, but it is on the wishlist she said. I nearly prefer spinach in its dehydrated form because it makes for great pasta (or my meatballs with bechamel sauce) and is a wonderful nutritional boost to anything while the family is completely oblivious. Sure, some might say it’s a passive-aggressive way to achieve optimal health; I prefer the term clever. I do not think most nutrition should be sneaked; kids should understand what constitutes a healthy diet and be encouraged to eat fresh, raw fruits and vegetables. However, complex flavors unaware to them will ultimately expand their palate so that the next time you introduce that icky green, it won’t seem so foreign—or icky. I have personally experienced this. And it started with vegetable powder. My kids were not keen on spinach, but I found that powdered spinach could work as a thickener and, if in small amounts, boost the nutrition without changing the flavor (color but not flavor). Over time, I got lazy and then used it as flakes; I think they know it’s in there. Like I pretend not to notice stuff the kiddos do on my weary days, I think they pretend not to notice the increased spinach flakes. Maybe I’m wearing them down. And just like my children increase the actions to which I turn a blind eye, their silence has only emboldened me. Why stop at spinach? Tomatoes, carrots, the possibilities are endless! I personally powder celery, onion, garlic, tomato, carrot, and spinach. A few weeks ago I got 5 pounds of asparagus from the local co-op. I checked in my “Preserve It Naturally” book (which comes with an Excalibur from Pantry Paratus), and guess what???? I can powder asparagus for use in soups! I really had no plan when I ordered 5 pounds of asparagus. It just sounded good. Other great soup and sauce additions are green beans, broccoli, cucumber, peas, and peppers. I was a primary caregiver for a child that was underweight and came from a difficult circumstance. She just would not eat. In desperation I turned to a cookbook that, although had some poor nutritional suggestions in it like vegetable oil, was written on the notion of making vegetable purees that could go virtually undetected in nearly anything. I made spinach brownies and chickpea chocolate chip cookies, stuff like that. The difficulty was that the pureed vegetables had to be either refrigerated for immediate use or frozen. This, for me, was not practical. In fact, we wrote a whole article about the hidden costs of the deep freeze (which do not even include things like losing food to freezer burn or power outages). Enter the Excalibur Dehydrator. Seriously in love. But if you really wanna hear me gush, go check out this article. Vegetable powder is seriously boots long-term food storage because its density means less quality-compromise from air exposure, and is far less bulky. Spinach and other leaves (herbs, raspberry leaves, kale, etc) get a rinse and then go straight into the dehydrator. To powder leafy greens you can pulse them in a food processor, break them up with your hands, or use a mortar and pestle. Garlic and onion get sliced or chopped, and then you simply arrange them onto trays. 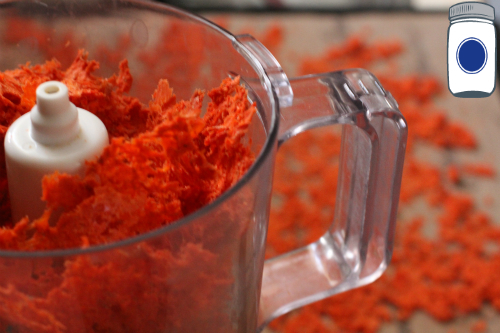 Once dehydrated, pulse in a food processor or use a mortar and pestle for small, immediate-use quantities. Other vegetables such as carrots and asparagus should be cooked (boiled or steamed). Once cooked, you can puree them and spread onto a paraflexx sheet. This is by far the simplest method, although you can blanch, slice, and dehydrate. However, I find that dehydrated sliced vegetables are more difficult to pulse into a fine powder. Once these vegetable leathers have dehydrated to a dry crispness, you can use them in cooking as sheets or flakes, or powder them using a food processor or mortar and pestle. Tomatoes and zucchini can be done to your preference; cooked or raw, peeled or unpeeled, sliced then in food processor, or as vegetable leather. My preference for these is to puree, make leather, and then keep some as sheets and powder the rest. 1) Dehydrate the food item according to specifications given in Preserve It Naturally until it passes the “clink test.” Many foods should snap when you break them, and you can check them by dropping onto a table. If they make a clinking sound, you have sufficiently removed the moisture. 2) Some foods will powder easily with mortar and pestle, but a food processor will be required for most foods and for larger quantities. 3) Store the powdered vegetable in vacuum sealed bags for long term food storage, and mylar bags will help eliminate the light and other variables. 4) For immediate use, place the powder in a pint-sized jar with an oxygen absorber and keep it away from heat, steam, and light. Put this on your calendar for this week. Then come back here and share your ideas with us! Proviso: Nothing in this blog constitutes medical or legal advice. You should consult your own physician before making any dietary changes. Statements in this blog may or may not be congruent with current USDA or FDA guidance. I have done the powder with spinach, kale etc. however, I have seen fruit powder posts. Have you tried fruit powder? I dehydrate the canned mandrine oranges which are really good but still a little sticky due to sugar content. I am afraid if I put them in the food processor it will just get all gummed up. I would appreciate any thoughts! Thanks! My experience with powdering fruits is fairly limited; things like dates do get all gummed up and you have to stop and clean it out often (but it makes a fabulous sugar substitute). I’ve powdered lemon rind and you do have to be light on using it as it can be bitter. I haven’t powdered any other fruits that I can think of immediately, but if you do it, share your success with us! 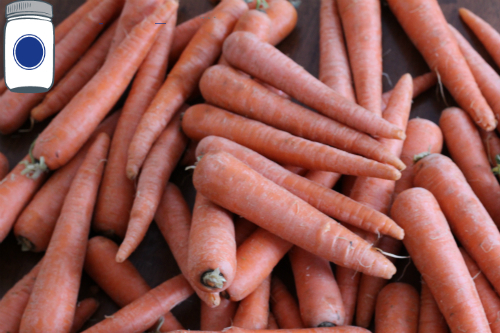 Could you powder vegetables and then rehydrate them with water to make baby food? I will be doing some travelling with my 8 month old and would love to be able to do this! Most definitely! The powdered vegetables, which you dehydrated fresh from the farmer’s market or your own garden, retain far higher nutrition AND flavor than canned vegetables. It’s better for baby and will taste better, too. Of course, depending on the age of baby, you may need to add some seasonings. Let us know what the baby enjoys by leaving another comment after your trip! I always dehydrate and powder any excess veggies before they go bad. I don’t have a dehydrator so I use the oven on warm. Works just fine. I grind them in a mortar and pestle then I keep adding them to a communal veg powder jar. The mix is ever-changing and seems to have taken on a life of it’s own. It’s always delicious though, and just a tablespoonful adds both color and flavor to whatever food it’s added to. Extra nutrition also, of course, and with a picky 12 y.o. in the house that is a really REALLY good thing. I stopped drinking coffee awhile back, now I add a nice spoonful of dehydrated vegetable powder to a cup of hot water in the morning to appease my desire to hold and sip a warm beverage as part of my morning routine. It’s delicious. I have one jar that’s a mix of random things, and it’s delicious. That jar started once when sick and I did some juicing for a week as part of my recovery. Well, I wasn’t about to let all of that pulp go to waste, and since I was using juicing recipes, the combinations tasted great together. Since then, I’ve added a bit here and there. But the thought never occurred to me to make a warm drink out of it–brilliant! Barley soup with veggie powder and preserved lemon. Awesome. My new go-to lunch. Thermos-friendly for on the go. Wonderful! And that would be a simple one to store dry on the shelf, too. If I don’t have mylar bags would freezing in bpa free ziplock bags preserve the nutrients. WHat is the main concern for nutritent loss – just vit c or are all the minerals like calicum for example still there? Also what is the disadvantage of using the oven at 170,as it is bit hgher timep than a deyhdrator. Do I need to worry about it or better to do it at 170 than not at all and I still will have a fairly nutritious product? Thank you!! The freezer slows down nutritional loss significantly, but it doesn’t eliminate it. Freezing the powders would maintain the full value longer than not freezing, though. You could certainly do that–freezer burn should not (in theory) be an issue because there should be no moisture in the powders. However, be sure the bags you use wouldn’t allow the powders to take on any moisture. As far as the heat of the oven, that temp is really okay, but it isn’t considered a raw food anymore if brought to a temperature higher than 90 degrees (some people have different numbers attached to that). 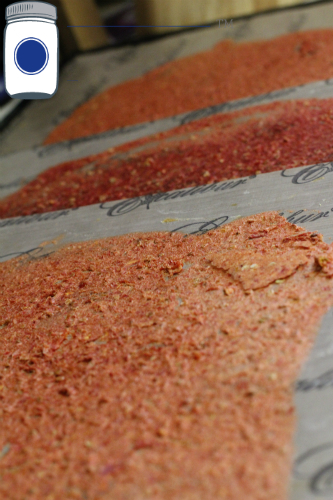 The greatest argument for a dehydrator, though, is the cost savings. 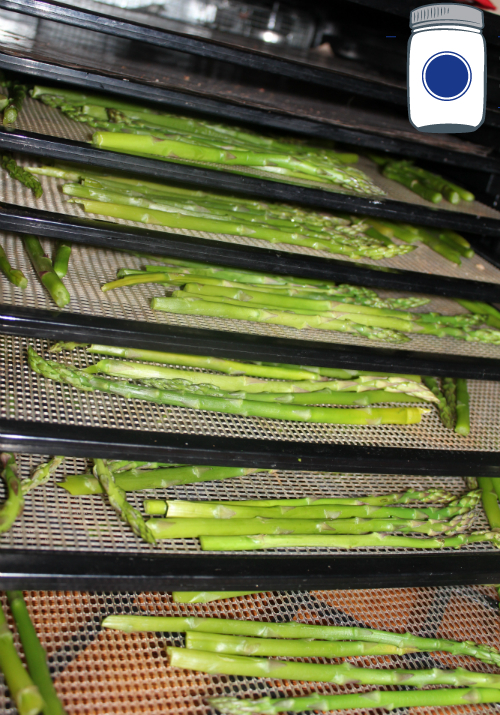 It’s pennies to run a dehydrator but your oven uses much more energy. 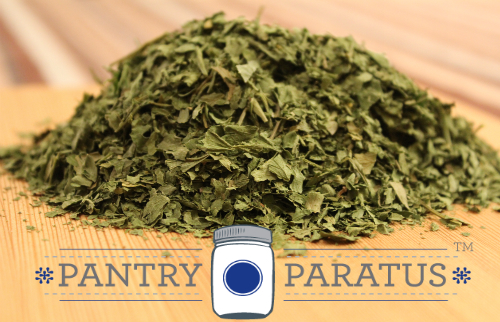 Be sure to check out the dehydrators at Pantry Paratus. We’ve also got some great articles about the cost savings of them, too. Thanks for commenting! I have just recently been dehydrating beets along with their leaves, kale, spinach, carrots, carrot tops/leaves, mixed berries and mushrooms. It may that I’m a little OCD, but I have been trying to find out what a serving would be along with the calorie count for said serving. I daily make green tea (between 8-12 oz) and then add one green powder and then the rest (except for carrot tops) but all that in my ninja and add some pineapple (frozen or fresh) and blend (I haven’t used mushrooms yet because I just dehydrated them yesterday). I have a ton of energy and I don’t have a lull in my mid afternoon anymore. I just want to make sure I’m not wasting my time with 1/2 teaspoon of each or I don’t want to over do it. IDK, just trying to get some solid information. Sounds like a powerhouse of a mix you’re making–good for you! People are often surprised at the level of food shrinkage with dehydrating, and without being aware of it, tend to overdo spices and dehydrated foods when cooking, so you’re asking the right question. Food can also be a bit inconsistent when dehydrating, based upon the vegetable variety, freshness of the vegetable, and the extent to which it has been dehydrated, but you can get pretty close in your estimating just the same. You would first need to know how much a full serving is of the fresh food, and then dehydrate that onto a single tray. Measure the contents of that tray after it has been dehydrated to get your dehydrated measure. Use that measurement in the future. Even if it isn’t exact, it will get you close! I have powdered avocado and kale. How do I measure them out? Are there any measuring charts. Like if I’m making a Spinach and avocado smoothie, how much powder equals half an avocado or 1 cup of spinach? 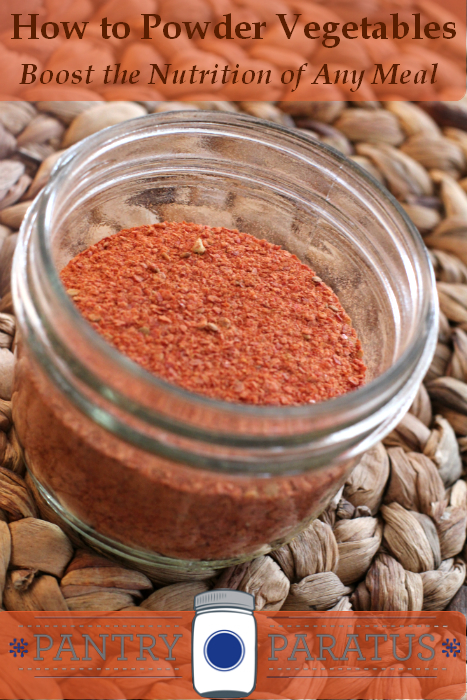 Is it possible to grind dehydrated veggies in a flour mill and use as a flour substitute ? I am wondering if the powders will be water-soluble in cold water?? I was hoping to make some fruit/vegetable powders that I could just add to a shaker bottle with water and it be similar to a juice/smoothie….